How conversational interfaces are making data collection more human. Web forms are the evolution of their paper counterparts. A collection of labels, boxes and circles designed to constrain input and make it easier for data to be processed. After all, a forms purpose is to collect data so an operation can be performed. To perform that operation the data we collect needs to be uniform. We place constraints on the interface to ensure this uniformity. Forms are designed to meet the needs of the process, not the user. 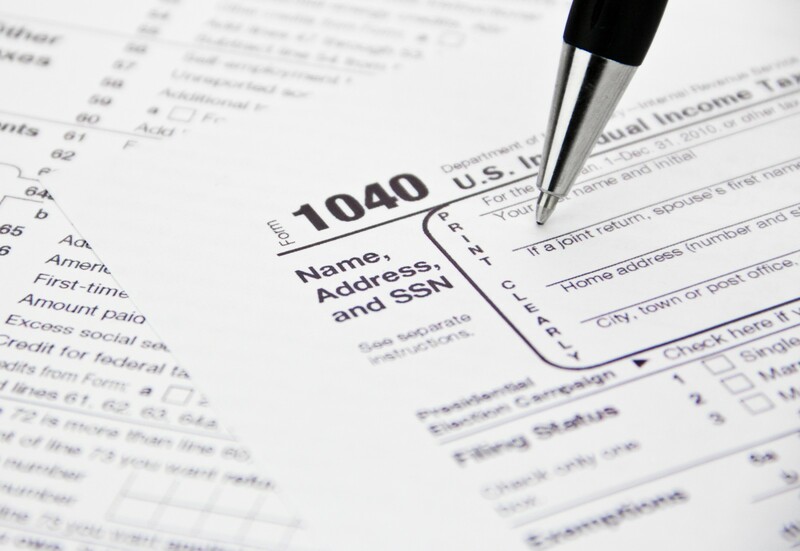 As with many digital things, forms have been heavily influenced by their analog predecessors. We have square boxes for writing in because that’s what we had on paper. Paper, a form factor where the primary input method was a pen or pencil. Things have changed, yet we allow ourselves to be confined by the same constraints put in place hundreds of years ago. Technology has freed us from these constraints. We’ve been given the tools to create more human interactions between people and computers. Spike Jonze’s film “Her” provides an interesting prediction for how we might interact with computers in the future. We are rapidly approaching a time when speech recognition, natural language processing and artificial intelligence are at a level for humans to hold meaningful conversations with technology. Even now, our tools are good enough to start building some of these experiences. So I bring you back to forms. How can we use these tools to make forms more human? We need to break away from our preconceived notions of what defines a form interface. To focus on building a more natural experience and using technology to mask, not remove, the constraints needed to perform operations. 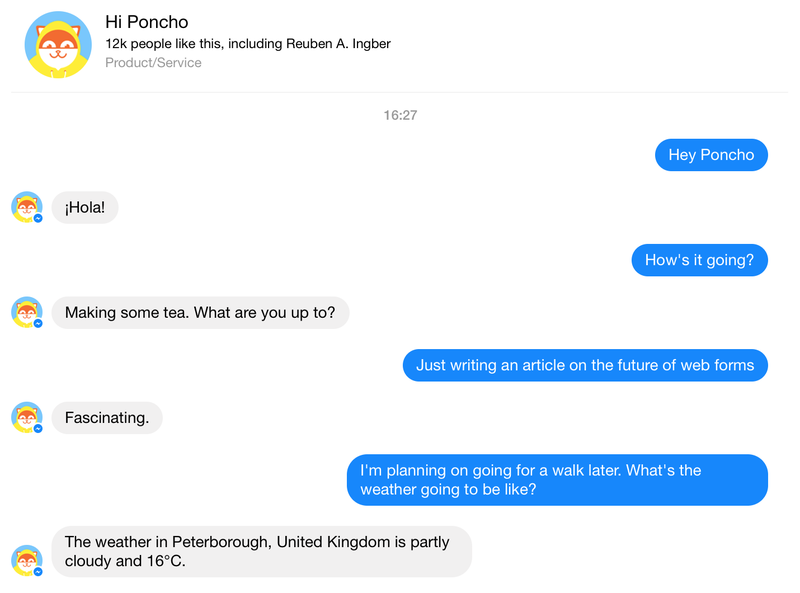 A conversation with Facebooks chat bot “Poncho”. Over the past few years we’ve seen the introduction of a bunch of new products that aim to make our interactions with technology more natural. Siri, Alexa, chat bots, these are all moving us in the right direction but we’re yet to see these innovations bleed into the browser viewport in a significant way. There’s so much potential for more conversational interfaces on the web and yet we still default to building forms out of a bunch of inputs and dropdowns when we need to collect data. Some people are pushing forward with this. The insurance service Jack, recently launched with an impressive page for collecting the details needed to provide an insurance quote. While the responses are still constrained, the design of the data collection process creates a much more enjoyable and friendly experience. 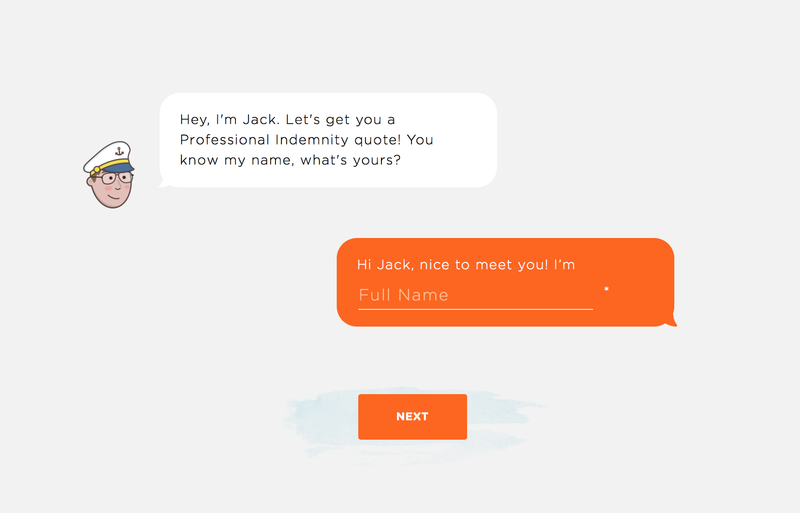 It would have been easier to just present the user with a standard web form, but by making the interaction with the user more like a conversation, Jack have managed to create something that feels far more natural. Adrian Zumbrunnen captured the webs attention a while back when he released his conversational personal site. 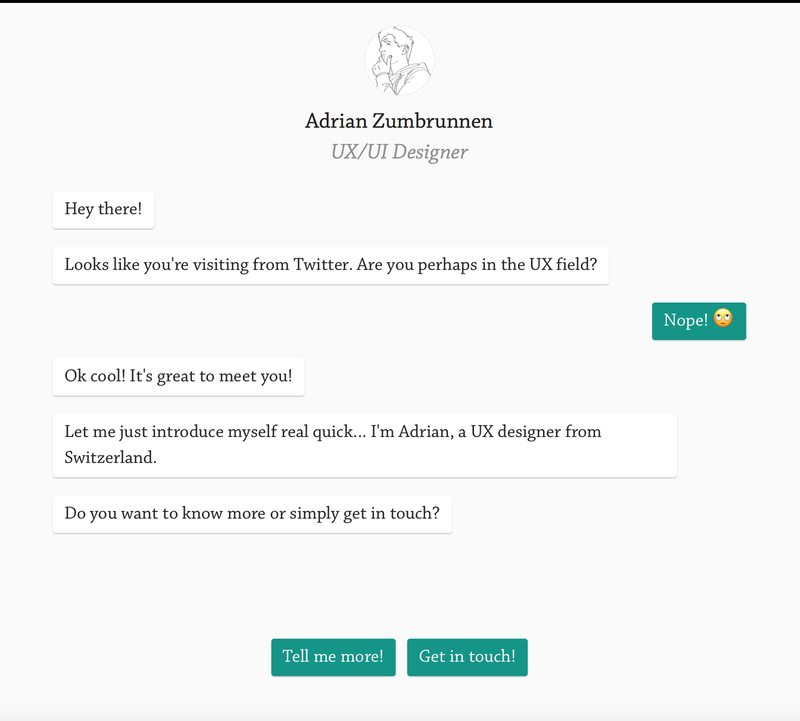 Adrian designed an interface that uses a selection of canned responses to guide the user on a tour of his work in the UI/UX field. Cleverly, Adrian’s website takes into account how the user reached his site and uses this as a signal to understand the user’s context. We’re moving in the right direction but it still feels like something is missing. To build a truly conversational interface the technology needs to have an understanding of the user’s intention and context that goes beyond canned responses and cleverly positioned text fields. We need to build on the work done in the chat bot space and develop interfaces that people can interact with using natural language. The interface should know who we are before we even start. The fundamental technology is already there for this. It’s called browser autofill. All of your details saved in one place, made accessible to a website with a simple request. The interface should adapt itself based on the context of the situation. Did you start a conversation from the support page of a website or the homepage of the marketing site? These signals can help us to understand the user’s context and therefore tailor the systems responses appropriately. This is something that Adrian’s website does well. Let’s experiment with how we might replace a sign up form with something more conversational. What would the sign up flow look like if we moved beyond forms? We have the data to do this today, but bringing it all together to create such a natural experience is really hard. Consider the implications for accessibility, privacy, multi-language support, emotional and compassionate design. These are all challenges we need to overcome if we’re going to introduce a new era of more meaningful interactions with technology. We’ve made incredibly progress so far but there’s still more work to be done. The future is just around the corner, but only if we’re brave enough to create it.